Tc-99m- and I-131-labeled arginine-arginine-leucine (RRL) peptides have shown the feasibility of tumor imaging in our previous studies. However, there have been no reports using RRL peptide for positron emission tomography (PET) imaging. In this study, RRL was radiolabeled with Ga-68 under optimized reaction conditions to develop a better specific and effective tumor imaging agent. RRL was synthesized and conjugated to a bifunctional chelating agent (DOTA-NHS), then radiolabeled with Ga-68. Labeling yield was optimized by varying pH, temperature, and reaction time and the stability was evaluated in human fresh serum. Cellular uptakes of [68Ga]DOTA-RRL and FITC-conjugated RRL in HepG2 cells were evaluated using a gamma counter, confocal microscopy, and flow cytometry. PET images and biodistribution were performed in HepG2 tumor-bearing mice after injection of [68Ga]DOTA-RRL or [68Ga]GaCl3 at different time points. Further, blocking study was investigated using cold RRL. The labeling yield of [68Ga]DOTA-RRL was 80.6 ± 3.9 % with a pH of 3.5–4.5 at 100 °C for 15 min. The cellular uptake of [68Ga]DOTA-RRL in HepG2 cells was significantly higher than that of [68Ga]GaCl3 (P < 0.05). Moreover, the high fluorescent affinity of FITC-conjugated RRL in HepG2 cells was shown using confocal microscopy and flow cytometry. After injection of [68Ga]DOTA-RRL in HepG2 tumor-bearing mice, tumor regions exhibited high radioactive accumulation over 120 min and the highest uptake at 30 min. After blocked with cold RRL, HepG2 tumors could not be visualized. [68Ga]GaCl3 was unable to show tumor images at any time point. The biodistribution results confirmed the PET imaging and blocking results. 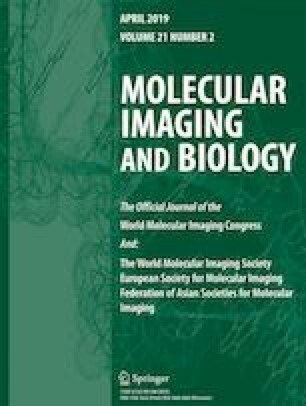 Our study successfully prepared [68Ga]DOTA-RRL with a high labeling yield under the optimized reaction conditions and demonstrated its potential role as a PET imaging agent for tumor-targeted diagnosis. Yan Huo and Lei Kang contributed equally to this work. The online version of this article ( https://doi.org/10.1007/s11307-018-1234-7) contains supplementary material, which is available to authorized users. This study was supported by grants from the National Special Fund for the Development of Major Research Equipment and Instruments (2011YQ03011409), Twelfth “Five-Year” Plan for Science & Technology Support (2014BAA03B03), Beijing Nova Program (Z171100001117024, Z181100006218126), Beijing Capital Special Development Application Program (Z141107002514159) and Peking University First Hospital Youth Program (2017QN13, 2017QN14).